This worksheet takes you through the first step to calculating your costs and pricing. Click to view this PDF. This worksheet takes you through the first step to calculating your costs and pricing, which is to identify as many possible costs as possible. These do vary for different operations, and for your new product. If you are starting a processing business, there are new categories of costs for equipment, skilled staff, maintenance contracts or time, repair costs, depreciation calculations, packaging, labeling development and machinery, and inputs if you are not growing the raw ingredients yourself. This worksheet will help you develop a realistic picture of costs. 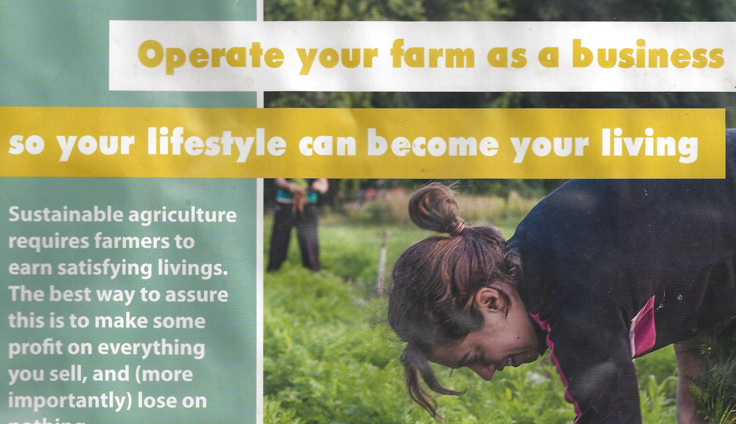 In farm or food businesses, owners often ignore costs that should be included to be sure the business is viable. These include your time, equipment or materials that you own, brought from home, or were given (that might have to be replaced and constitute a cost of the business). These calculations often underestimate the cost of marketing (talking to buyers when you are delivering) and transportation in your own vehicle. Even if you deliver on your way to town for another purpose, the cost of the business should include wear and tear on the vehicle, your time, fuel, and parking costs. Counting these at the beginning means that as the business grows beyond your own resources, you will already have included these costs in your pricing, and can expand to pay for staff and new vehicles to accommodate growth. The other resources below will offer some resources for cost categories for producers as well. Many of the same cost categories apply for value added products; a worksheet for value-added calculations is also below. This spreadsheet is an example of the detailed templates available from OMAFRA. Click to download this Excel spreadsheet. The Rural Agri-Innovation Network created this spreadsheet to combine sales tracking with production planning. Click to download this Excel spreadsheet. 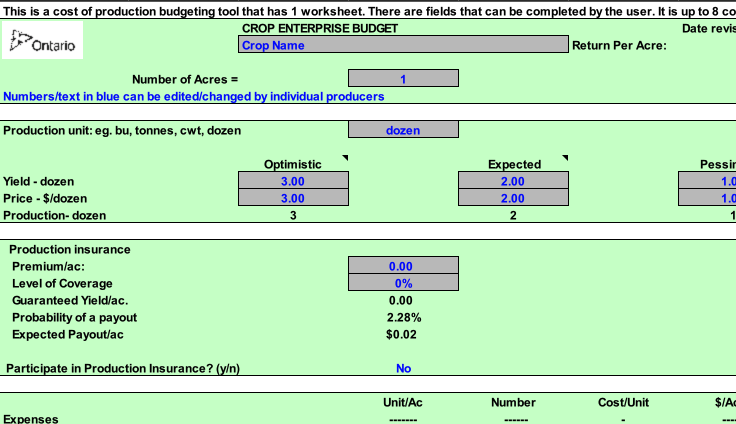 This resource uses several linked spreadsheets based on a cost of production spreadsheet created by Vern Grubinger, University of Vermont Extension as well as the list of products in the RAIN spreadsheet above. Click to download this Excel spreadsheet. This is Vern Grubinger’s original spreadsheet. Click to view this PDF. 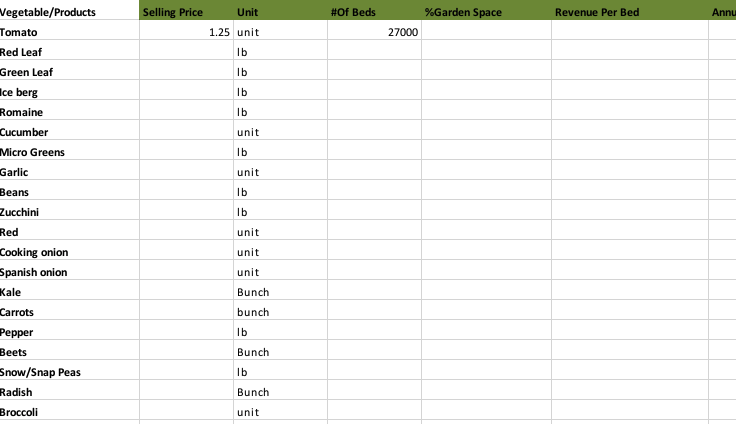 Here's another example of a basic spreadsheet for a small tomato farm in Tennesee. Click to download this Excel spreadsheet. David Cohlmeyer prepared this brochure on costing for the Greenbelt Farmers’ Market Network. It bundles all sales and provides a basic template for calculating fixed and variable costs and annual income from a 5 acre market garden. Click to view this PDF. Part of the pricing calculation is to compare your own calculations that are built up from your costs with your market research results in the previous module. Is your price in line with the competition? If not, can you adjust some parameters to bring it more in line, or come up with a strategy that will ensure that customers will pay more? The following video takes you through the process of juggling these different pieces of information to come up with realistic pricing. Below, Sally Miller describes the difference between calculating margin and markup and demonstrates the calculations to build your pricing from your costs and then to build backwards from the prices for similar products at retail or wholesale markets. These calculations will allow you to compare options and decide on a pricing strategy, as well as to test your cost of production against market prices. This more detailed spreadsheet from the Southern Sustainable Agriculture Working Group provides for cost of production and market planning for multiple market channels. Click to download this Excel spreadsheet. Three interlinked spreadsheets to help you assess production cost. Click to download this Excel spreadsheet. some knowledge of the key sensitivities of your model to crop failure, price changes of inputs and raw ingredients, etc.